Q: Not even vanilla / strawberry / chocolate? Q: Have you ever tried frozen yoghurt? You can almost feel their disbelief. I’m obviously not the person they thought I was. I’ve let them down. Most think that it’s weird, and by association assume that I must be too. What other dark secrets could I be hiding? Others just feel sorry for me. Who, after all, doesn’t like ice-cream? It’s associated with summer, birthday parties and holidays. It’s repeatedly listed as one of the most popularly eaten comfort foods. A quick search of the internet tells me that it’s commonly described as ‘yummy’ and that it tastes ‘awesome’, neither of which, incidentally, help to explain what it is that people find so irresistible. It also reveals that the ‘yummy-ness’ of ice-cream is frequently discussed in terms of toppings (especially by American consumers), but however delicious someone might find hot fudge, peanut butter sauce or caramel, that still doesn’t tell me what, exactly, is so good about ice-cream itself. And yet its popularity is clearly ubiquitous. Ice-cream is – apparently – so wonderful that people including Van Halen and Tom Waits have been sufficiently moved to actually sing about it. Of course, food preferences are based on both taste and texture, with most people expressing a liking for creamy textures, as well as foods that melt in the mouth. 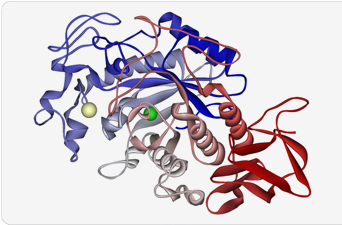 Importantly, scientists have suggested that the rate at which this happens is influenced strongly by an individual’s ability to break down starch, which is dependent, at least in part, on the amount of an enzyme – amylase – that a person has in their saliva: more amylase means that starchy foods are broken down faster. Apparently, this might even explain individual preferences for different brands of ice-cream which contain varying amounts of added starch. And given that starch is broken down into simple sugars, this isn’t just related to texture but also to taste. So, it might be that the amount of amylase that I have in my saliva is linked not only to the way I react to the texture of food, but also to my not having a particularly sweet tooth. Perhaps this, then, is responsible for my dislike of ice-cream? I just can’t imagine that it’s going to help the next time someone asks if I’d like some. I certainly agree that some of the flavours sound wonderful (although many don’t). A friend of mine has recently come back from a holiday in Italy, enthusiastic about the pineapple/basil/lime and ricotta/fig/caramel concoctions that she enjoyed whilst there. I have to agree that both sound absolutely incredible, and I’m positive that this really would have been ice-cream at its very best. But while I might have been tempted to try the first, I just don’t believe that the latter could possibly have been improved by turning it into a frozen purée. This, I suppose, is the crux of the matter. I just don’t understand the appeal of ice-cream. And, just as people who are passionate about ice-cream seem to have difficulty in explaining the attraction, I can’t really describe what it is that I don’t like about it. I just don’t. It’s cold. And wet. It melts. (But not – apparently – at the right speed for me). So, maybe my dislike for ice-cream really is best explained ‘scientifically’; the result of a simple biochemical reaction. But there is definitely an emotional response as well, and not just from those around me. I’ve always felt as though I must be missing out on something. Why can’t I like ice-cream? And just how much happier would I be if I did? So, in the pursuit of happiness, I do periodically try ice-cream, hoping to have a sudden revelation about its true glory. (It hasn’t happened yet). But I’ve never been tempted to make it, until now. I came across this recipe accidentally and was immediately hooked (which seemed like a good start), intrigued by the idea of turning this classic pairing – pea and mint – into a spectacular dessert. It’s no secret that I adore mint, and love the fabulous flavour that results when it’s combined with peas. I’m not quite sure what I was expecting, but it might have been a hope that something that sounded so wrong, would just somehow have to be right. I’m afraid not. Perhaps not surprisingly, the dominant flavour was of peas (duh! ), and although it has been growing on me (it really is an acquired taste even in tiny portions), it certainly isn’t going to convince me that ice-cream is either ‘yummy’ or ‘awesome’. And in case you’re wondering, no-one else likes it either, although we’re all very impressed with the texture of this home-made, hand-made ice-cream, which was actually more straight-forward to make than I imagined it would be. Of course, eating ice-cream that isn’t sweet contributes to a rather curious reaction, and it has occurred to me that using it as an accompaniment to something else might do a lot to improve the overall impression, but I have yet to discover what that might be. I would certainly welcome any suggestions. But the real question is this… Do I now go ahead and make the beetroot and chocolate ice-cream that I’ve come across since? I don’t have a particularly sweet tooth, and therefore didn’t add icing sugar here. I’m increasingly convinced that it’s got to be the missing ingredient that would turn this into something amazing, So, If you do try this at home, I can only suggest that you add some! To make the custard, heat the milk and cream in a pan to just below boiling. Cool a little. Whisk the egg yolks and sugar together in a bowl, then pour on the hot milk and cream, whisking till smooth. Return to a clean pan. Cook gently, stirring all the time, until the custard thickens. Don’t let it boil or it will ‘split’. Remove from the heat and leave to cool until tepid, stirring often to stop a skin forming. Strain the cooked custard into a bowl, cover with cling film and cool, then chill. Make a minty pea purée: simmer 350g peas with 2 mint sprigs until just tender. Drain, rinse under cold water and discard the mint. Blitz the peas in a blender with 4 tablespoons finely shredded mint and 2 tablespoons crème fraîche until smooth, adding a dash of milk if necessary. Stir the chilled custard and pea purée together. Taste and add a little icing sugar if necessary – the ice cream will seem less sweet once frozen. Leave to cool, then chill. Once cold, churn the mixture in an ice-cream maker until soft-set, then transfer to a suitable container and freeze until solid. 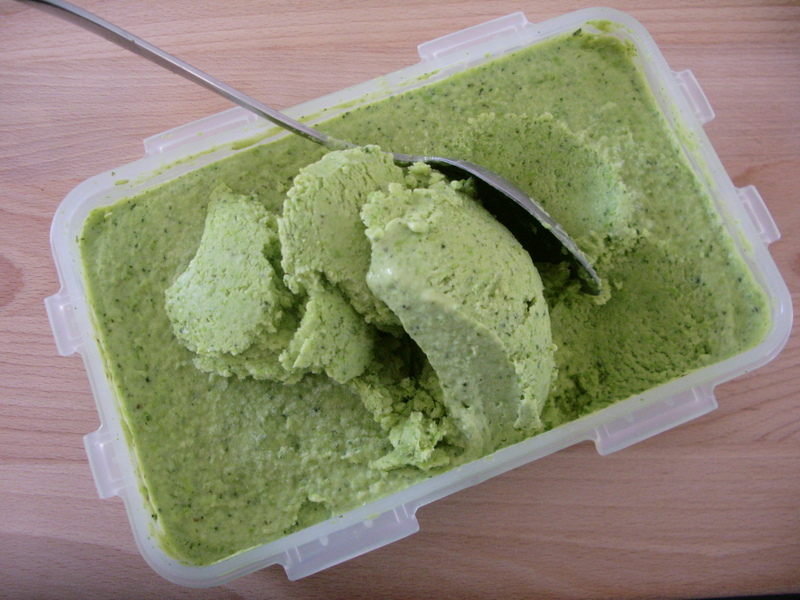 If – like me – you don’t have an ice-cream maker, freeze in a shallow container, mashing with a fork at hourly intervals (at least three times) before the mixture is solid. Transfer to the fridge 20-30 minutes before serving, to soften a little. This entry was posted in Food, Recipes, Sweet things, Vegetables and tagged dessert, hand made ice cream, home made ice cream, I don't like ice cream, ice cream, mint, pea and mint ice cream, peas. Bookmark the permalink. Wow, that’s disappointing. I hate going to the trouble of making something and then finding that it just didn’t make the cut. Too bad because pea and mint might be a refreshing intermisso or ice between courses. But ice cream? I think I agree with you. It’s funny, really, given that I don’t like ice-cream, but I was disappointed – although the process of making the ice-cream was interesting in itself. I think you’re right that it would be better as an ice or sorbet, but I’m going to leave that particular experiment to someone else! Thanks Sophie. I thought that it would be sweeter too. Although the recipe did suggest that it would be less sweet after it was frozen, I was surprised by just how much it had changed, and it would have been worth adding some icing sugar before starting the freezing process. I really didn’t think that it would need it though. I’m sure that I will try the beetroot and chocolate eventually, but I’ve got to get through this first (I refuse to throw it away), and that’s going to take some time! 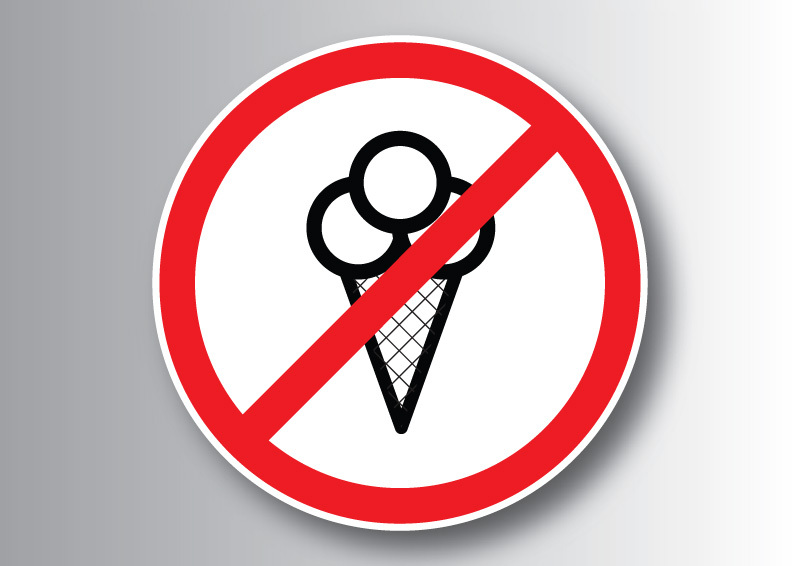 However, I do now have the perfect response when people ask why I don’t like ice-cream… It’s just that I’m sophisticated and unique! Thanks. Well, it was an interesting process, but I’m definitely not going to try and persuade anyone to make it themselves! Kudos for giving it a go every now and again. What a flavor to try! And for the fantastic science lesson. (was a food sci major in college) Am going to say no on the beetroot flavor. Will mention the irony of my reading your post and commenting while my ice-cream maker churns Uganda Vanilla Bean-Cinnamon ice cream. I know not to ask you if you want any, haha. But I think no less of you. To each her own. Thank you Liz. You’re more than welcome to my portion of ice-cream anytime! And I think it’s delightful that you were making ice-cream yourself as you read this post. And in the spirit of full disclosure, I should also point out that I’m not particularly fond of cinnamon either! Thank you for not trying to persuade me that your wonderful sounding ice-cream would ‘cure’ me, and I really hope that you enjoy it immensely. 🙂 Would never try to talk someone into liking something they know they don’t! The name alone doesn’t sound very appealing to me. I don’t think I’d like my ice cream with veggies at all. Well, it was a bit of an experiment, but you definitely would have been right in this case! What an interesting flavor combination for an ice cream! I like your scientific explanations. Thanks for sharing! Your’re welcome. Interesting is a very good word for this ‘experiment’! Thanks for stopping by. Very interesting and your honesty is refreshing. Beet root and chocolate? Hmmm….also interesting. I say, go for it! Great post, I laughed at the reactions of most people because the first thing I said when I read that you don’t like ice-cream was “really”! I love ice cream but don’t like sorbet so much, we are all different which is how it should be! Ha!Ha! It’s an incredibly predictable reaction actually – I guess that very few people dislike ice-cream! Thanks for your comment. That’s really interesting, BAM. At the risk of sounding even more weird, I do actually like most ice lollys (I can offer no explanation for that either!) and would definitely try this if I visit China again in the future. Thanks for your comment. Not at all – I thought it sounded appealing and I don’t even like ice-cream!